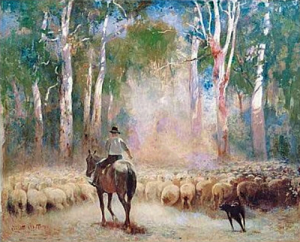 Banjo Paterson wrote ‘Waltzing Matilda’ and is one of Australia’s most famous and respected poets, so much so that he’s featured on Australia’s $10 banknote, along with an illustration based on another of his epics, ‘The man from Snowy River’. But this, in my view, is his finest work. It helps if you read it in an Australian accent, but just read it any way you want to, for it’s simply brilliant, however you do it. Just "on spec", addressed as follows: "Clancy, of The Overflow". "Clancy's gone to Queensland droving, and we don't know where he are." For the drover's life has pleasures that the townsfolk never know. Through the open window floating, spreads its foulness over all. But I doubt he'd suit the office, Clancy, of "The Overflow". The Bulletin, 21 December 1889.